When the FLOTUS talks, you listen — even if you're all the way across the pond. Apparently First Lady Michelle Obama is curious to know what's happening to the dramatic crew at Downton Abbey — so much so that she wrote Britain's ITV1 requesting season three before the January 2013 premiere in the United States. Since Obama's been campaigning since before time began, I think she's earned a quiet evening with everyone's favorite cast of eccentrics, sluts, and straight-up sociopaths, wouldn't you agree? An ITV source told The Sun: "We know it's very popular in America as it's so quintessentially British. We'd heard the Obamas liked to watch it but we were very surprised when someone from the First Lady's office got in touch asking for the series." "They were very polite and we were more than happy to sort out some DVDs for them to send over. Obviously we hope they keep the spoilers to themselves as our US fans may not know about... well, you know what!" It looks like the First Lady's wishes are Julian Fellow's commands. Also, I know what you're all thinking: Downton slumber party at the White House! Who's in? I want to watch Mr. Bates be human Eeyore and Lady Sybil progressively wear pantaloons as I cuddle with Sasha and Malia and then raid the White House kitchen! This is getting dangerously close to Fanfic so I'm gonna peace now. Certainly m'Lady! 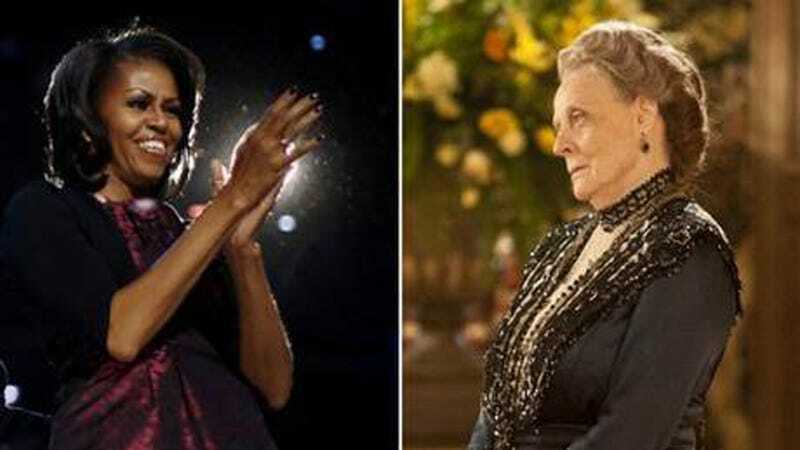 Michelle Obama requests Downton Abbey series three early.